Vodafone has amassed a decent amount of spectrum, won big at the recent 5G spectrum auction and is already carrying out various 5G trials, including some UK firsts. It’s got big plans too, with seven UK cities set to get 5G trial networks imminently and an ambitious goal to bring 1 gigabyte per second speeds to its customers at home, work and everywhere in between. Vodafone is in no rush though, having revealed that it probably won’t launch a 5G network before 2020 and probably won’t have widespread coverage until years after that. But doing things right is surely better than doing them fast, and its roll out timing and speed should still be roughly in line with most rivals. Here’s everything you need to know about Vodafone 5G in the UK, including its launch plans, its spectrum holdings and what it’s currently working on. Vodafone has a large 4G network, with over 98% of the UK population covered at last count, which could help with 5G as well, because initially networks will likely use a mix of 5G and 4G technology. This widespread coverage also shows that Vodafone has a strong commitment to upgrading and expanding its network, which will likely continue into 5G. It’s also focused on speed, as Vodafone also has a 4G LTE Advanced network in some locations, which can be seen as a stepping stone between standard 4G and 5G. With all that in mind it seems likely that Vodafone would make a big push into 5G, potentially seeing it catapult ahead of rival networks and develop new technologies faster. Vodafone came out of Ofcom’s recent 5G spectrum auction with 50MHz of 3.4GHz spectrum, which it paid £378,240,000 for and specifically acquired the 3410MHz – 3460MHz part of the band. That’s more than any other rival acquired, as EE and O2 each got 40MHz while Three won just 20MHz. That could put Vodafone in a strong early 5G position, as 3.4GHz spectrum should be ideal for the upcoming technology, though notably Three already had some before the auction. Vodafone also has 176MHz of immediately useable spectrum in other bands. This is less suited to 5G and Vodafone has less of it than EE, but it still has a reasonable amount. Note: ‘Immediately useable spectrum’ refers to spectrum in various bands that can be used now for 4G, 3G and 2G. Vodafone holds spectrum in the 800MHz, 900MHz, 1.4GHz, 1.8GHz, 2.1GHz and 2.6GHz bands. Note also that Vodafone should have plenty of opportunities to acquire more spectrum, as Ofcom is set to auction off some in the 3.6GHz – 3.8GHz range and the 700MHz band at some point, and is also planning to look into other frequency bands that might have auctionable spectrum suited to 5G. Vodafone plans to start offering 5G services in early 2020, which could see it launch slightly behind EE and BT, but probably around the same time as Three and O2. This slightly later launch may also mean Vodafone is less dependent on existing technology from day one – a situation which O2 claims will lead pre-2020 5G networks to be ‘5G lite’. Vodafone has additionally said that it sees its 5G roll out as following a similar timeline to 4G, which is to say it will be gradual, with 50% of UK devices getting a 5G connection by the mid-2020’s. We don’t know which places will get Vodafone 5G first, but London is sure to be among them, as it’s the biggest UK city and as that’s where Vodafone’s 4G network started. Birmingham, Bristol, Cardiff, Glasgow, Liverpool and Manchester may also be first in line, given that the network has announced trials in those cities (more on that below). Vodafone has carried out the UK’s first trial of 3.4GHz spectrum for 5G use. The network also tested Massive MIMO in the process. Perhaps even more excitingly, it’s announced 5G trials in Birmingham, Bristol, Cardiff, Glasgow, Liverpool, London and Manchester, which are set to kick off between October and December 2018. This is apparently the most comprehensive 5G trial in the UK to date and will be used to test virtual and augmented reality in factories, hospitals and offices. Vodafone is additionally set to carry out 5G New Radio field trial collaborations with Nokia and Qualcomm. And Vodafone’s focus on speed has already hit a major milestone, as in partnership with Huawei it’s achieved 20Gbps speeds in a 5G field test. Vodafone has also become the first mobile operator to complete a standalone pre-standard 5G test, and along with other companies has approved the first 5G standard. These trials and Vodafone’s 5G plans in general are part of a ‘Gigabit UK’ plan the network has, which would see customers able to access speeds of 1Gbps or more wherever they are, using a combination of 5G and fast fixed broadband. Vodafone seems primarily focused on speed and Internet of Things (IoT) applications with 5G, but it’s starting with the basics, and has partnered with Huawei, Nokia, Qualcomm, Ericsson and Intel to both research 5G and prepare its network for the technology transition. Vodafone has already started working towards a 5G network, including building some Massive MIMO sites in the UK. Massive MIMO base stations use 64 transmit and 64 receive streams, rather than the two elements used by current antennas. It’s a foundational 5G technology which will allow more data to be transferred as well as improving coverage, and Vodafone claims to be the first European network to deploy it. And when it comes to the Internet of Things, Vodafone isn’t even waiting for 5G to expand its capabilities, as it plans to add Narrowband-IoT support to its existing network to bring 5G-like benefits ahead of time, by improving indoor coverage and supporting a high number of low-power devices within close proximity. It’s already carried out a Narrowband-IoT test on a live commercial network, so we may see the fruits of its labour soon, but we’d expect even better IoT services from Vodafone once 5G does arrive. This entry was posted in 5G and tagged 5G, 5G development, 5G spectrum, 5G trials, vodafone on October 1, 2018 by Tim Cosgrove. 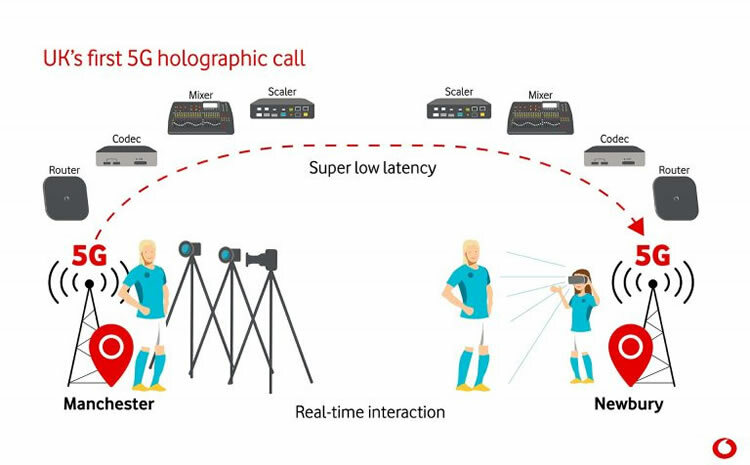 Vodafone has just completed the UK’s first live holographic call over 5G, with England and Manchester City Women’s Football Captain, Steph Houghton MBE being projected as a hologram from Manchester to Newbury. During the call she gave footballing tips to 11-year-old Manchester City and Lionesses fan, Iris, emphasising in the process the potential for holographic calls to be used for remote coaching and training, as unlike just a phone call or even a video call, it’s almost like the person is actually there. There are all sorts of useful things this technology could be used for, such as essentially placing all participants of a conference call in the same room, letting fans get closer to their idols – whether sports stars, musicians, actors or anything else, or just making calls a lot more personal and more like a face to face conversation. It’s one of many new technologies that the high speed and low latency of 5G could power. Of course, there’s other tech involved in holograms than just 5G, and as Richard Foggie of the Knowledge Transfer Network explained to the BBC, headgear or an enclosed ‘cave’ is required to view holograms currently, limiting their viability, but he predicts that five years from now that hurdle will have been overcome. By which point 5G should be widely available. In fact, you shouldn’t have to wait long at all to start getting 5G from Vodafone, as the network has also announced that it will bring 5G to Cornwall and the Lake District during 2019, with 1,000 5G sites set to be active by 2020. That’s notable for two reasons. Firstly, Vodafone had previously said not to expect 5G from the network before 2020, so it seems as though it has accelerated its launch, putting it more in line with EE and BT. Secondly, it sounds like the network will be putting a lot of focus on rural areas in the early days, which is surprising, but potentially a good thing, as there has been concern that rural places could initially get left behind, leaving a greater digital divide between them and cities than there is now. It seems Vodafone doesn’t want to let that happen. This entry was posted in 5G and tagged 5G, holograpic, Steph Houghton, vodafone on September 21, 2018 by Tim Cosgrove. Vodafone has made a big 5G announcement, as it’s just revealed that seven cities will become trial areas for Vodafone 5G later this year. The cities in question are Birmingham, Bristol, Cardiff, Glasgow, Liverpool, London and Manchester, and the trials are set to begin between October and December 2018. Vodafone claims this is the most comprehensive 5G trial announced to date, and adds that the trial will be used to test new 5G applications, including virtual and augmented reality in factories, hospitals and offices. 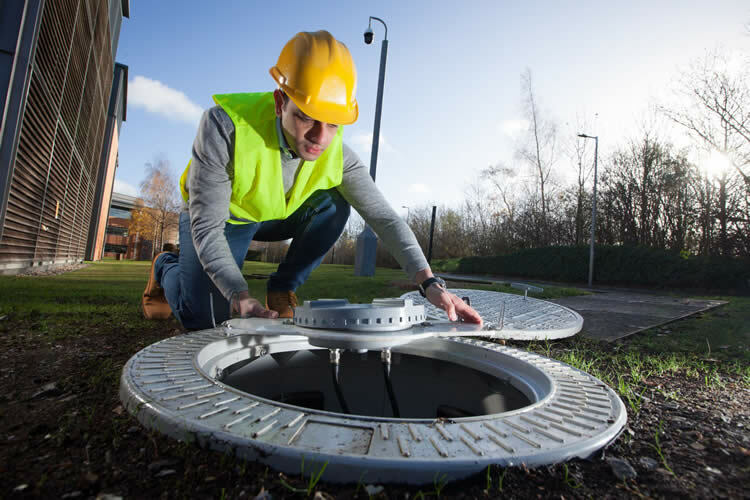 In advance of these 5G trials, Vodafone’s engineers are already busy laying the groundwork for a 5G network at more than 40 sites in these cities. Above shows James Hope, Head of Networks for the North, Vodafone UK, pictured with one of the new 5G base stations in Manchester. The trials are part of an ambitious plan that Vodafone has dubbed Gigabit UK and which envisions a UK where everyone can get speeds of one gigabit per second or more, wherever they are. It’s a plan that will involve both the launch of a widespread 5G network and upgraded fixed broadband connections. And speaking of Vodafone’s 5G network, the company has additionally said that these upcoming trials should help ensure it’s ready for a full commercial launch in early 2020. That will likely put Vodafone ever so slightly behind EE and BT, both of which might launch in late 2019, but Vodafone is still in a strong position, having purchased the most 5G spectrum at the recent Ofcom auction, a purchase which Vodafone claims has allowed it to begin these widespread 5G trials, having already carried out an earlier trial with the spectrum. It’s worth noting also that these trial cities might well be among the first locations to get full 5G once Vodafone does launch it commercially. The company hasn’t said as much but it would make sense given that it’s being trialled in these locations, and given that they’re major cities. This entry was posted in Uncategorized and tagged 5G, 5G trial, vodafone on June 20, 2018 by Tim Cosgrove. Continental is helping to make the world’s roads safer with Vodafone’s support through the new digital tyre monitoring platform, ContiConnect. The companies are using the Internet of Things (IoT) to connect commercial vehicle fleets to the digital tyre monitoring platform to improve road safety and vehicle efficiencies. ContiConnect is currently deployed in US, Canada, Malaysia and Thailand with the rest of the world to follow. ContiConnect communicates tyre temperature and pressure data to a central web portal via the wireless network, allowing fleet managers to continuously monitor the data for their entire fleet. If low temperature or high pressure data are reported the system automatically sends an alert to the driver and the central fleet manager, providing recommendations on resolving the issue. The new platform helps prevent expensive tyre-related breakdowns and accidents affecting commercial fleets, and maximises vehicle uptime. The Vodafone mobile communications network transmits the data securely, reliably in real-time to destinations around the world. Special Continental sensors continuously monitor tyre pressure and temperature data and transmit it to a receiver unit. The receiver unit then transmits the data in real-time to the Continental server where a software program analyses it. If any of the values are critical, ContiConnect sends an alert so that the fleet manager can take action. ContiConnect is putting commercial vehicles in the ecological fast lane. The regular data streams that are sent to the fleet managers help them to plan tyre changes and maintenance far more efficiently, improving the operational performance and lifespan of the tyres. Tyre pressure monitoring also contributes to protecting the environment because tyres that are operated at optimum pressure save fuel and reduce commercial vehicles’ CO2 output. For example, a tyre operating at just 80% pressure uses around 0.9 litres more fuel for every 100 kilometres driven. Over an average distance covered of 120,000 kilometres per year, that’s 1,080 litres more fuel consumed for each tyre. So in addition to the environmental benefits, ContiConnect also improves commercial fleet profitability. The system transmits data by SMS or e-mail, so the driver doesn’t need to have a display unit in the cockpit. And the global Vodafone network ensures that fleet managers have real-time data on all their vehicles that are out on the road. This entry was posted in IoT and tagged ContConnect, Continental, IoT, smart tyre, vodafone on April 26, 2018 by Tim Cosgrove. We’ve heard a lot about AI-driven cars in recent years, but 5G is set to enable another kind of driving revolution. 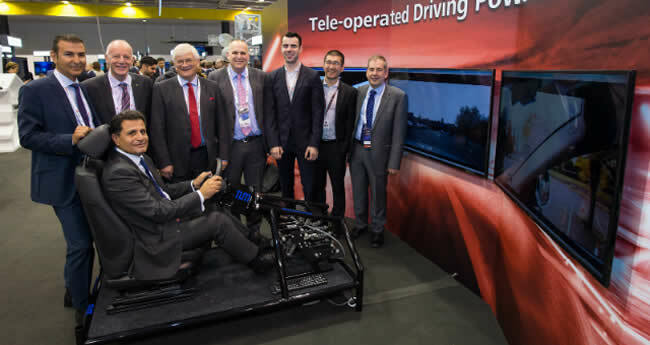 Vodafone has teamed up with Huawei to demonstrate how 5G can be used to remotely control a vehicle. The test took place at the 2017 Global Mobile Broadband Forum. It involved a car located on the University of Surrey campus being controlled from London’s ExCel centre some 50 kilometres (30 miles) away. This was done via a fully encrypted pre-standard 5G connection. It was intended to demonstrate how, in future, it would be possible to remotely control machines in dangerous or extremely remote environments. The example has been given of mining or waste disposal situations, but it would also have a number of potential applications in day to day life. For example, in a recent white paper on practical 5G use case scenarios, Huawei highlighted the potential for a premium concierge service in which the driver of your car does so from elsewhere. This could “enable someone to participate in a conference or to work while on a journey, or to support a taxi service, or to help a person without a driving license, or when they are ill, intoxicated, or otherwise unfit to drive”. 5G is uniquely suited to hosting such a feature. Crucial to this is the forthcoming network standard’s extremely low latency of less than 10 milliseconds, which will enable instructions to be received and acted upon as quickly as the human eye can perceive change. In the case of the recent Vodafone test, this resulted in a mere six centimetres of braking deviation when the car travelled at a speed of around 20 kilometres per hour. Another benefit of 5G network technology to remote car control is its heightened level of security. After all, the last thing you would want in such a situation is interference from a malicious third party. 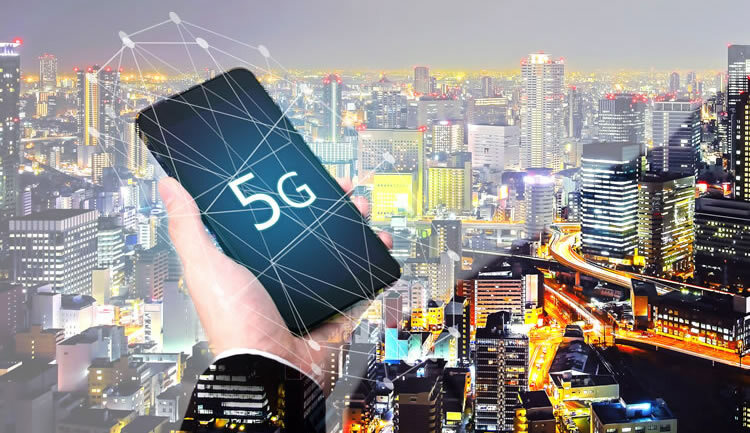 Luke Ibbetson, Vodafone Group’s Head of Research and Development and Technology Strategy, said: “The 5G standard is close to completion and it’s encouraging to see how important capabilities such as low latency and increased reliability are shaping up. This was the first test of its kind in Europe. The world’s first such demonstration occurred in June 2017, when Huawei teamed up with China Mobile and SAIC Motor in Shanghai. However, in this initial test the driver was only situated 30 kilometres away from the car. This entry was posted in 5G and tagged 5G, China Mobile, Huawei, SAIC Motor, vodafone on December 19, 2017 by Tim Cosgrove. Ericsson has today announced the formation of a cross-industry consortium to strengthen 5G research and development in Germany. Members of the “5G-ConnectedMobility” consortium are Ericsson, BMW Group, Deutsche Bahn, all three German mobile network operators -Deutsche Telekom, Telefónica Deutschland and Vodafone, the TU Dresden 5G Lab Germany, the Federal Highway Research Institute (BASt) and the Federal Regulatory Agency (BNetzA). The Federal Ministry of Transport and Digital Infrastructure and the Bavarian Road Construction Administration support the project. For the mobile network infrastructure, sites of the Motorway Directorate North Bavaria (ABDN) being the local roads authority, Deutsche Bahn and the mobile network operators – Telefónica Deutschland and Deutsche Telekom are being used. The connection occurs via a glass fibre infrastructure of the local roads authority and Deutsche Bahn. The concentration point of the network is located in an equipment container equipped by Ericsson, which has been installed on the premises of the motorway maintenance agency in Greding. The core network will be operated from Ericsson’s ICT Development Center Eurolab near Aachen, which supervises Ericsson’s “5G for Germany” program amongst other things. The connection to this core network will be carried out via Vodafone’s “Interconnect Access” of the ABDN. This entry was posted in 5G and tagged 5G, BMW Group, Deutsche Telekom, Ericsson, Telefonica Deutschland, TU Dresden 5G Lab Germany, vodafone on November 23, 2016 by Tim Cosgrove. Huawei announces that working with Vodafone it has successfully tested 5G mobile connectivity using high and low frequency bands. The companies have demonstrated 1.5 kilometers cell coverage in the lower C-Band and 5Gbps peak throughput for a single user in the high band. It is the world’s first 5G large scale mobility field test of macro coverage in dense urban city scenarios. The support of mobility capability plays a key role in the adoption of 5G applications such as augmented reality (AR) and virtual reality (VR). 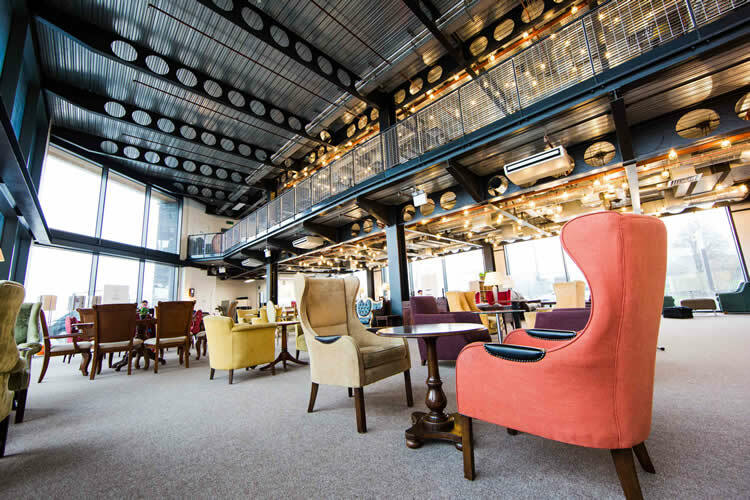 It is believed that these applications could require more than 100Mbps average data rates and gigabit speeds for multiusers in hotspot areas. The performance achieved in this realistic environment study is an important reference for next generation mobile network (NGMN) and European trial initiatives to develop and verify solutions for a future 5G commercial launch plan. In the joint research of 5G New Radio (NR) candidate technologies, it is demonstrated that Filtered-OFDM, Sparse Coding Multiple Access (SCMA) and Polar Code works stably with the massive Multi-User MIMO (MU-MIMO) technology, and the spectrum efficiency is improved approximately three times when compared with LTE. According to the field test, the peak cell throughput of 18Gbps under 200MHz bandwidth in the Sub6GHz band, and air interface latency of 0.5ms in the 5G New Radio user plane were achieved. 5G will be the next generation of mobile technology set to be available by 2020. Huawei and Vodafone signed a 5G strategic memorandum of understanding (MoU) in 2015 and a 5G Technologies Acceleration MoU in 2016. This entry was posted in 5G and tagged 5G, 5G tests, Augmented Reality, Huawei, Luke Ibbetson, NGMN, vodafone on October 18, 2016 by Tim Cosgrove.